We LOVE this in our entryway! Will be so fun to rotate the cut outs too, thank you for your free local delivery too!! These are so fun and I love how we can add/embelish if we want! High quality work! I bought them for all of my family members from the Midwest and they love them too! Hi! My name is Samantha. 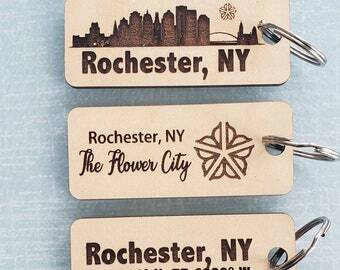 I live on the east side of Rochester, NY with my wonderful husband and our three sweet daughters, who serve as my inspiration each and every day. I went to school for graphic design and textile design and have always loved working with various materials, even as a child. For the past 9 years, I have been the proud owner of a custom stationery business, Sweet Pea Print. I acquired a laser cutter to help create intricate invitation designs and soon realized that I was only scratching the surface on what I could really do and create for others. With the versatility of my designs and a laser cutter, I can now produce a wide variety of attractive products using various materials. This led to the creation of a new branch of Sweet Pea Print called May&Birch. 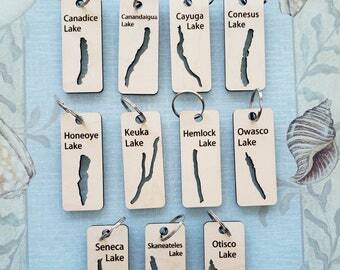 May&Birch specializes in laser cut and handcrafted pieces including wooden ornaments, earrings, lake art, gifts, home décor, and more. The feedback for May&Birch has been amazing so far and it has reinvigorated my creativity and brought a whole new level of joy into my life. I hope you enjoy my products for years to come. Welcome to LayeredCrafts! Custom, handcrafted, unique and personalized wooden gifts, silhouettes, ornaments & home decor is our specialty. Since all of our work is custom designed and approved by you, orders cannot be returned. Our current turn-around time is 3-5 business days for an in-stock item. 1-2 weeks for a custom order.